Greg is a Cisco and Mikrotik certified technician with 10 years of experience working in the data center and networking industries. Learn more about Mikrotik at his consulting blog www.gregsowell.com. Data center cooling is boring and so is oatmeal. My doctor tells me that oatmeal will lower my cholesterol and save my heart, so sometimes boring is a good thing. Cooling systems are often overlooked in the creation of the data center, but excess humidity and heat can cause damage to data center infrastructure. It is important to understand the pros and cons between the different types of cooling systems. Here’s some cool information about DC AC that you can take to heart (I promise we are done with the puns). Water-based cooling systems require an outdoor chiller and pump with indoor variable frequency devices, controls, CRAH units, and filter and leak detection. • Chillers are a pack with fins and fans. Fan blades are regularly lost and frequent repairs are needed. • It’s necessary to ensure chillers don’t shut down in cold weather. With a lead and lag chiller, water must run constantly and special mechanisms must be in place. Cold climates require a glycol mix, which makes the system higher maintenance and more expensive. • A failure within a single unit will result in cooling loss. A backup chiller is required for 2N redundancy. With a chilled water loop, an outdoor pump is required to keep the water flowing. If this unit fails, you’ll lose cooling. A backup pump should be considered. VFD are what control the speed of the pump. If you have multiple pumps, you’ll need multiple VFD. Controls maintain the temperature of the chilled water loop. It will command the chiller on, control the orientation of valves, control the speed of VFD, monitor differential pressures, maintain status of temperature probes throughout the loop and monitor flow rate. Chilled water loops require filtration. A sock is typically installed and must be maintained. Flowing water requires leak detection around joints and cooling units. Gas systems are similar to the cooling systems at your home. These are typically smaller units. Each indoor unit will correspond to an individual outdoor condenser unit. Because this is a gas system, freeze protection is less of a concern. These systems can be used for large deployments and will be less expensive than a chilled water system. The indoor cooling unit controls the operation of the outdoor condenser unit, which means less system intelligence is required. For small office data centers, this option will supplement your cooling as it is simpler to retrofit and is less expensive. There are multiple ways to build a highly available network. Let’s assume you require a 100% concurrently maintainable network, which ensures when any one connection is lost you can maintain network connectivity. If you maintain multiple connections that end users must access 24×7, you can achieve connectivity through DNS and BGP. Consider what happens if you have two separate carriers providing diverse IP subnets and your end users are accessing them via DNS and your primary carrier fails? Your users will attempt to access unavailable services. To avoid those situations, set the time-to-live on DNS entries to five minutes ahead of time, which will allow you to change the IP addressing. As the updated DNS propagates, it will allow your users to slowly adjust. There are automated DNS services such as UltraDNS, which monitor external services, detect a failure and automatically adjust DNS entries. The advantage of an automated system is that it performs failover at any time and you can expect a failover of roughly 5 minutes. BGP is a dynamic routing protocol that controls the flow of information on the Internet. BGP allows you to influence the flow of traffic both in and out of your network and is preferable to DNS management. An Autonomous System Number (ASN) is assigned via a local registry. This ASN allows you to peer with upstream providers. You can advertise your registry-assigned IP addresses with your primary and secondary ISPs. If one ISPfails, the identical addresses are available via your secondary ISP. Multiple connections should be hosted on multiple routers to maintain connectivity should a single router fail. Border routers can then be connected to redundant firewalls. From the firewall, you should have connectivity into a pair of core switches for layer 2 aggregation. Can you see the pattern? For max redundancy, host connectivity on multiple devices from beginning to end. Often this configuration can be collapsed where multiple functions are performed via a single piece of equipment. Your required uptime should be balanced with cost. Maintaining your generator is a critical step in keeping your data center up and running in the case of power failure. The industry average is nearly three outages per year from natural disasters, human error, power outages or routine maintenance. It’s important to run regular tests to ensure your generator can operate at peak performance if needed. WEEKLY: Generators should be exercised regularly. Generally, a weekly run schedule is employed. 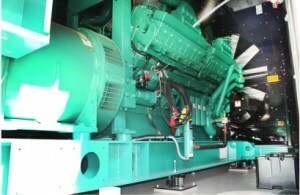 Often a generator will run for 30 minutes during a testing phase. more heavily. The added load will increase the temperatures in the exhaust system and burn off any lingering hydrocarbons. QUARTERLY: A certified technician should inspect your unit quarterly and change the engine oil. During these events, the generator will be put in shutdown mode, which means without an N+1 power configuration you run the risk of outage. ANNUALLY: Generator batteries should also be closely monitored and replaced every 3-5 years. Deep cycle sealed batteries are recommended. More cranking amps will be to your benefit in those cold months. As per your manufacturer, schedule any plugs, filters or coolants that need to be replaced. Remember when working around a generator, ALWAYS put it in manual or emergency stop. The last thing you want is for it to fire while you have your hand anywhere near the unit. Whenever working around generators, be sure to wear hearing protection. After any maintenance is performed, you should run through a “back in auto” checklist to ensure all systems are prepared to carry the IT load.